I am deeply fascinated by China and it’s tremendous economic progress over the recent past. It has successfully managed to raise 100s of millions from poverty in the recent past. However years of fiscal stimulus and adversity to societal change for better accountability by the regime has left it on the brink of a slowdown. Why is it important? Because India is in the same position that China was a few decades back. It is important to learn from mistakes and not repeat them. This is an interesting movie about how companies trading on the US stock exchange siphoned off investor funds into the pockets of promoters of businesses which didn’t have anything on the ground, how facts were fudged and no regulatory oversight meant investors losing billions of dollars. All of this was done with protection from the Chinese government officials and police. The movie explores the Chinese mentality, businesses and why caution should always warranted in anything that sounds too good to be true. The movie is available on Netflix. 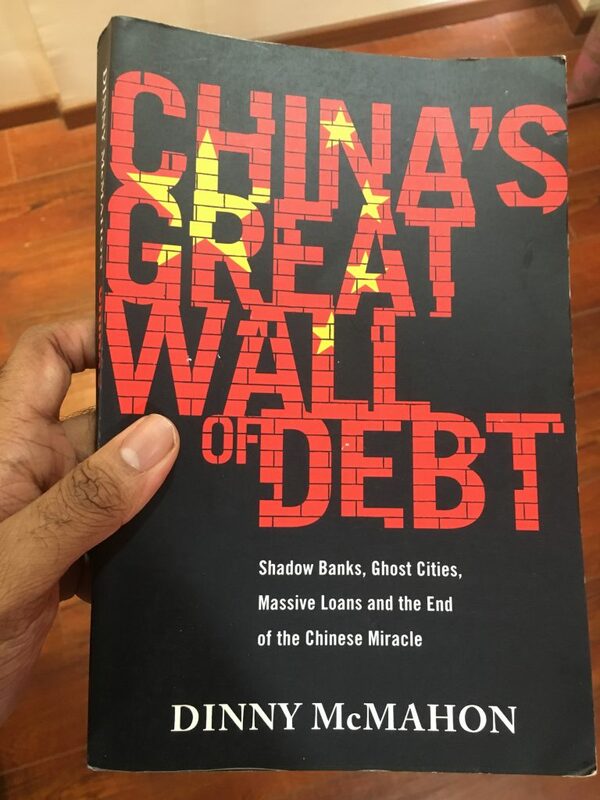 China’s Great Wall of Debt is a book written by Dinny McMahon, a journalist who’s lived and spent decades writing about China. The book talks in depth about shadow banking and wealth management products, how Chinese finance industry has grown, how late stage growth isn’t adding as much value anymore, overcapacity in Chinese firms, real estate and other problems brewing in the Chinese economy. While Chinese economy has grown leaps and bounds and pulled millions out of poverty, the book talks about problems brewing which the govt. is happy to kick down the street to not disturb the social fabric, a fabric is fragile and sacred to the Communist Part of China to remain in power. It also talks about economic ideas and concepts which are unique to China. All of the credit expansion has been easier because China has a very high savings rate so the problems haven’t manifested themselves in inflation. Capitalmind has a very good book review about the same. All of this can be verified from independent reports of massive overcapacity, late stage infrastructure and housing boom crumbling because low quality materials were used in construction due to corruption and a resurgence of party propaganda posters/statues and ideals in common life, possibly to replace the economic boom with something else to maintain political stability. A China trip is definitely on my bucket list. Thanks for reading. I hope to write more finance/interesting country related topics.